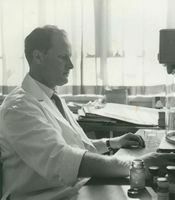 Bert Nesbitt at the microscope (1950’s). In 1947, H.H. (Bert) Nesbitt was recruited from Agriculture Canada as Carleton’s first biologist, by Dr. H.M. Tory. Two years later, Bill Illman was also lured away from Agriculture Canada. Other early Biology faculty included Ed Turnau and Isabel Bayly. Classes in those early years were offered downtown, at the former Ottawa Ladies College. The daunting task of creating a biology program on a shoestring budget, was accomplished by sheer determination, and a procurement policy of “beg, borrow and acquire”. The Department of Biology was officially established in 1952, offering a wide range of undergraduate courses in general biology, genetics, zoology, botany, physiology, mycology, entomology and taxonomy leading to degrees in Arts or Science, or Honours degrees in Biological Sciences. With the opening of the Rideau River campus of Carleton University, the Biology Department moved to the Tory Building in 1960. 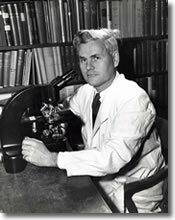 1960 also witnessed the establishment of the graduate studies program for Biology. Two small greenhouses were constructed on the roof of the Tory building in 1961-1962 to provide materials for teaching and research. The official opening of the Environmental Laboratories, in September of 1969, marked a period of rapid expansion in the department. This building housed Carleton’s extensive plant collections, and offered both greenhouse and growth chamber facilities for research and teaching. In 2000 several Biology research labs moved into the Nesbitt Biology Building, which was created by renovation of, and addition to the Environmental Laboratories. The Department is now housed in four buildings with the teaching laboratories in the Tory Building, and research labs in the Nesbitt and Steacie buildings and the Carleton Technology Training Centre. 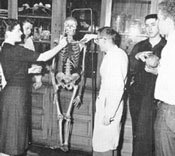 Biology students examine a teaching skeleton (1950’s). Currently, the Department of Biology offers over 50 undergraduate courses for Bachelors and Honours degree programs in Arts, Science, and combined degree programs with Physical Geography, Geology and Psychology. For Graduate Studies, the Department of Biology offers programs leading to M. Sc. and Ph.D. degrees in molecular, cellular and developmental biology, plant and animal physiology, ecology and systematics.